After her husband dies, Maxie discovers she’s spent most of her adult life living in a house of cards. Now she's destitute in a down economy. Her practical daughter – who has her own set of problems with an unemployed husband and hellion daughter – insists that Maxie begin a new life of austerity and sacrifice. Maxie shops at Daffys instead of Bergdorfs. She takes the bus instead of a car service. She’s given up the Met, MOMA, BAM, and even Botox. Nothing seems to help. If only someone… anyone… would recognize all the talent Maxie has to offer. Victoria – Tall, attractive, powerful professional woman in her late thirties, early forties. Maxie – Victoria’s mother. She can be quite glamorous and looks ten years younger than her age – 70. Harmony – Victoria’s 13-year-old daughter. She is slightly overweight and quite buxom for her age. She is a handful. Greg – Victoria’s husband and Harmony’s father. He is rather withdrawn, until you bring up his favorite subjects – artificial intelligence and robotics. Christopher – Typical New York recruiter/headhunter who specializes in executive-class recruiting. Peter – Maxie’s boy friend. Very handsome man is his mid 60s. Place - Manhattan, New York, New York. Victoria and Greg’s loft, Christopher’s office and Maxie’s bedroom. My life as a writer would be non-existent if I hadn’t met Lynda Sturner almost 20 years ago. I had given up being a playwright and then I saw this woman on stage in a terrible play at the Provincetown Inne and I knew I had to meet her. Little did I know that I would end up writing more than two dozen plays - two of them with her as a collaborator. A Talented Woman won the 2013 New Playwright, New Plays Competition and the Kaplan Prize awarded by Eventide Arts. 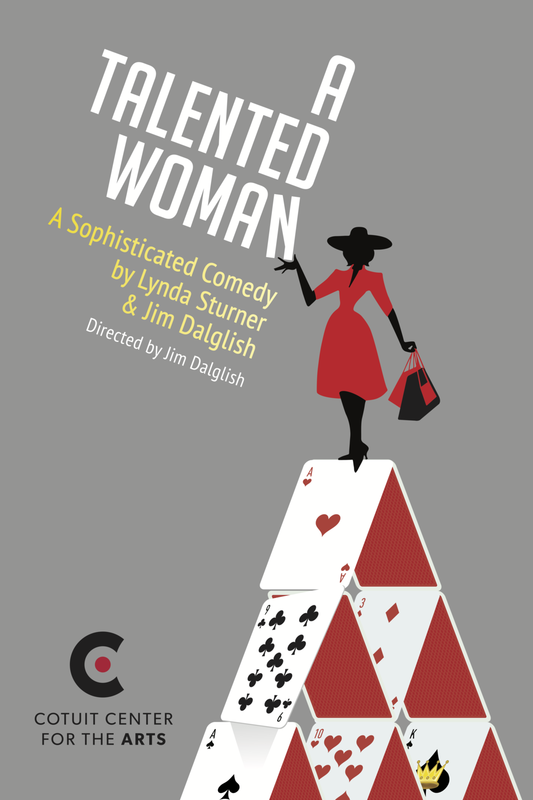 The $1,000.00 prize included two readings of the play on March 22 and 23 at 7:30 at the Gertrude Lawrence Stage of the Eventide Arts Center in Dennis, MA. 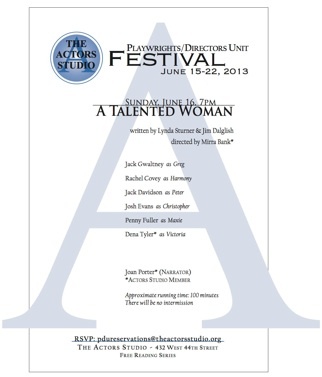 A Talented Woman was a semi-finalist for the 2013 National Playwrights Conference at the Eugene O'Neill Theater Center. The McCarterLab at the McCarter Theatre Center in Princeton, New Jersey, June 27, 2014. Directed by Mike Donahue. “Best of…” Festival at The Actors Studio in New York, New York, June 16, 2013. Directed by Mirra Bank. Playwrights Festival, The Provincetown Theater in Provincetown, Massachussetts, May 12, 2012. Directed by Margaret Van Sant. New work to get reading at Eventide, by Lee Roscoe, March 14, 2013, Barnstable Patriot. If the odd couple wrote plays in Provincetown, by Deborah Minsky, May 10, 2012, Provincetown Banner.